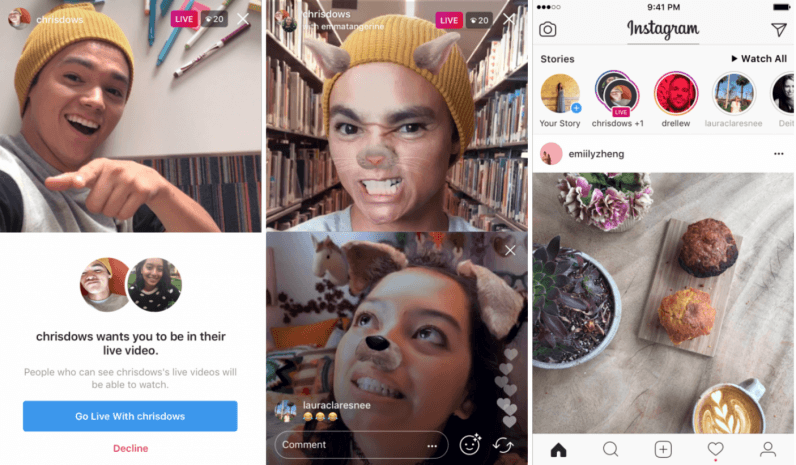 Instagram now allows users to broadcast a live Story with a friend. The feature was tested with select users in the past few months, and it’s finally out for everyone to use. Shared Stories allows users to pick anyone who’s currently watching their live broadcast to join in. Once its linked, the screen splits into two and anyone who follows each user will be able to see the combined live Story — it’ll show up as a stacked circle on the Stories timeline. A feature like this opens the door to all kinds of uses for live Stories: from interviews, to celebrities interacting with each other, spicing things up from a regular live Story — or even a two-way video call. For now, the app only allows two users to broadcast a story together, but could eventually develop to integrate multiple accounts. The Stories can be kept for 24 hours, deleted, or even shared on Facebook. Rounded up: it’s a public video call — and what does that mean for the future of Instagram? Instagram has gone from simply sharing photos, to messages, to Stories, live Stories and now: shared live Stories. Am I the only one who thinks it’ll eventually evolve into a video call app, too? Simply speaking, I could make my Instagram Story private to everyone but my friend who I want to talk to. This way, we could make a shared live Story and have a video call. It’s obvious that’s not the simplest option at the moment when you have FaceTime or Skype, but eventually could be. So far, the Facebook-owned application has had no problem straight up copying anything Snapchat has done right — and video call makes a logical next target. Since launching Stories in August of last year, Instagram’s users have soared to 700 million monthly active users globally, proving that as long as they do Snapchat better than Snapchat, they’ll succeed. Instagram, unlike Snapchat used mainly by teens, has a wider audience, and could use this as a trial on what could eventually become an integrated video conference app. Collecting stats regarding user demographics from its newest feature, they can decide whether it’s worth moving in that direction. A feature like this could also attract new users, or even motivate those who already have Instagram accounts to give them a better use. It’s a lot more tempting to have photos, messages and video calls in one place — and it also takes up less space on your phone. By introducing Stories, Instagram showed its users that two apps could be integrated into one. By adding video calls, it can compete with Skype and Instagram could be your go-to app for any kind of messaging.